Gibraltar. I took the cable car up to the summit of the Rock of Gibraltar. It was a bit chilly at the top so I took my windbreaker out of my backpack and put it on. No sooner had I turned around when a big Barbary Macaque jumped on my back. I yelled. I stomped my feet. I jerked from left to right but it held on. I couldn’t see it but it had dug its claws into my shoulders and was quite heavy. In desperation, I walked toward a wall with the intent of banging it off. As I neared the wall, it jumped off. No doubt the big monkey had experience with that human tactic. The cable car ticket included the fee for an audio phone tour. 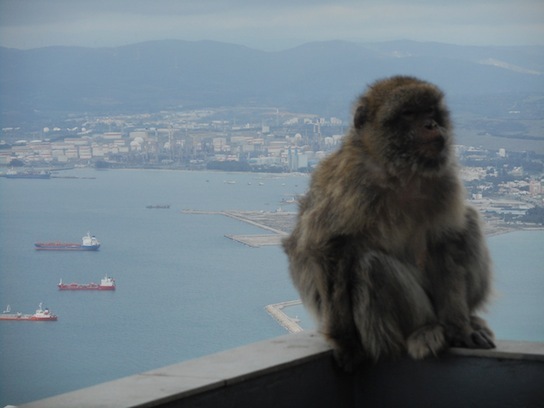 That audio tour reported that it was said the British would only leave Gibraltar after the Barbary Macaques were gone from there, leading Churchill to ship more of them in. That is what it said. 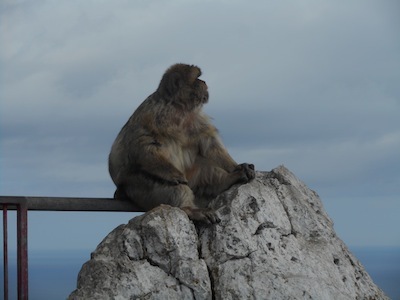 Click here to see what Wikipedia says about the Barbary Macaques in Gibraltar and click here to see what Mark Twain had to say about them.